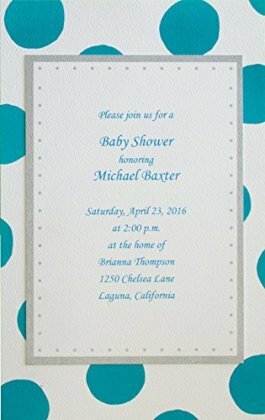 These Baby Shower Invitations can be used for a Boy, Girl or Twins. You can even use them for a birth announcements or birthday parties. The wording is customized by you! With the printable top cards you get 2 extra sheets for setting up your printer. These unique invitations come with everything you need to make one of the most beautiful invitations your friends and family have ever seen. The kit includes 15 taped base cards 17 printable base cards and 15 envelopes. The Invitations are made of the highest quality 80# felt cover paper and come with a thick 70# envelope. They are very easy to put together even though the finished product looks as though it took you hours!